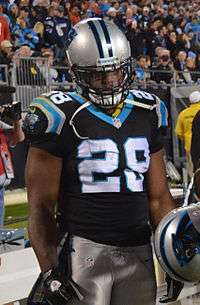 Jonathan Creon Stewart (born March 21, 1987) is an American football running back for the Carolina Panthers of the National Football League (NFL). He was selected by the Panthers in the first round (13th overall) of the 2008 NFL Draft. He played college football at the University of Oregon. Stewart is the career leading rusher in Washington prep football history. At Timberline H.S. in Lacey, Washington, from 2001 to 2004, he rushed for 7,755 yards and scored 105 touchdowns. In 2001, as a freshman, he rushed for 1,279 yards on 95 carries (13.5 ave) and scored 15 touchdowns. In 2002, as a sophomore, despite an ankle injury causing him to miss almost half of the season, he rushed for 1,609 yards on 153 carries (10.5 ave) and scored 14 touchdowns. As a junior, in 2003, he rushed for 2,566 yards on 285 carries (9.0 ave) and scored 45 touchdowns. As a senior, in 2004, he rushed for 2,301 yards, averaging 11.2 yards per carry and scored 32 touchdowns. Against Centralia High School in 2004, Stewart rushed for 422 yards and scored 9 touchdowns. Stewart was also on the school's track & field team, where he competed mainly as a sprinter. He placed third in the 100 meters at the prelims of the 2003 3A District IV Championships, with a season-best time of 10.90 seconds. He ran a career-best time of 10.78 seconds in the 100 meters in 2005, that still stands as the school's fastest time ever. As a University of Oregon collegiate, he competed in the 60-meter dash, recording a personal-best time of 6.88 seconds at the 2007 MPSF Championships, where he placed fifth. In a national recruiting battle, Stewart chose the University of Oregon over USC, Notre Dame, Nebraska, California, Ohio State and other schools. Coming out of Timberline High School in Lacey, Washington, Stewart came to Oregon as one of the highest profile recruits in the program's history. He was known for his rare combination of speed and size, recording a SPARQ rating of 97.54 as a senior in high school. Stewart's true freshman season was highlighted by a pair of kickoff return touchdowns which made him the program's first player to ever return more than one kickoff for a score. Stewart ended up leading the nation in kickoff return average (33.7 yards-per-return). Stewart finished his sophomore season as the team's leading rusher. He finished 19 yards shy of 1,000 yards rushing despite missing some time due to lingering ankle injuries. He recorded five 100 yard games in the season and the Ducks were 5-0 in those games. Stewart also caught 20 passes for 144 yards including a touchdown and he again finished near the top nationally in kickoff returning (6th in the country). In Oregon's controversial win against the University of Oklahoma, Stewart impressed, rushing for 144 yards and a touchdown. In the final regular season game against rival Oregon State University, Stewart rushed for 94 yards and three touchdowns. He finished the season with 10 rushing touchdowns and one receiving score. Stewart and the Ducks opened the 2007 campaign 4-0, with wins over Houston, Michigan (in Ann Arbor), Fresno State and Stanford. Against Michigan, Stewart ran for 111 yards and a touchdown on just 15 carries. He followed up that performance with 165 yards rushing and two touchdowns on just 17 carries against Fresno State. Stewart's second touchdown, an 88-yard scamper, was the longest run ever in the 41-year history of Autzen Stadium. The following week against Stanford, Stewart picked up a career best 310 all-purpose yards, including 160 yards rushing and a ten-yard touchdown run. In Oregon's showdown against Cal, Stewart ran for 120 yards and a touchdown on 21 carries, in a 31-24 loss to the Golden Bears. Stewart chipped in 66 rushing yards in Oregon's 53-7 drubbing of Washington State, then had a record setting day against rival Washington. Stewart had a career high 32 carries for 251 yards and two touchdowns, the latter being the second highest single game total in Oregon's history. Stewart continued his impressive play with a 103-yard, 25 carry, two touchdown performance against USC in Oregon's 24-17 home win. Against then #4 ranked Arizona State, Stewart ran for 99 yards on 21 carries (including a 33-yard touchdown scamper), caught two passes for 26 yards and another score, and returned five kicks for 122 yards. Stewart concluded his record setting season with a career high 39 carries against rival Oregon State, accumulating 163 yards along the way. In Oregon's 56-21 bowl win over South Florida, Stewart ran for a career high 253 yards, setting a Sun Bowl record for rushing yards and earning him the C.M. Hendricks Most Valuable Player award. On January 11, 2008, Stewart announced his decision to forgo his senior season at Oregon and to enter the Draft. On March 12, 2008, Stewart underwent surgery on his big toe and was expected to be out four to six months. Stewart, 21, was ranked among the top three running backs entering the April draft, along with Darren McFadden and Rashard Mendenhall. Stewart would share carries with DeAngelo Williams, a 1st round pick in 2006. In his first game against the San Diego Chargers, Stewart ran the ball 10 times for 53 yards. In his second game against the Chicago Bears, Stewart helped the Panthers recover from a first half deficit, scoring two second half touchdowns from four and one yard respectively. Stewart finished with 14 carries for 77 yards and the first two touchdowns of his young NFL career. Stewart had two solid performances gaining over 100 rushing yards in weeks 11 and 14. In the week 11 game vs. the Lions Stewart rushed for 130 yards on only 15 carries, adding a rushing touchdown. In week 14 against division rival Tampa Bay he ran for 115 yards on 15 carries with two rushing touchdowns. Stewart would go on to finish the 2008 regular season with 10 rushing touchdowns, a Carolina Panthers rookie record. Stewart also added 836 rushing yards on 184 carries with a 4.5 rushing average in his rookie season. Stewart added his first postseason rushing touchdown against the Arizona Cardinals on January 10, although the underdog Cardinals won convincingly. In Week 6 of the 2009 NFL season, Stewart piled up 110 yards on 17 rushes with a touchdown. He and DeAngelo Williams combined for 262 yards in a victory versus their division foe, the Tampa Bay Buccaneers. In Week 13 of the 2009 NFL Season, Stewart made his first career start for an injured DeAngelo Williams, and recorded 120 yards on 26 rushes and a touchdown in a 16-6 victory over Tampa Bay. In Week 16 of the 2009 NFL Season, Stewart, starting for the injured Williams, recorded a team record 206 rushing yards in a 41-9 rout of the Giants in their final game at Giants Stadium, and earned FedEx Ground Player of the week honors. The performance lifted him over the 1,000 yard mark, making him and DeAngelo WIlliams only the 6th rushing duo in NFL history to rush for 1,000 yards in a single season. He later surpassed the 1,100 yard mark, making him and Williams the first rushing duo in NFL History to rush for 1,100 yards apiece. Stewart finished the season with 1,133 yards and 10 touchdowns on 221 carries, slightly outperforming Williams in both categories. Stewart started the 2010 NFL Season once again splitting carries with DeAngelo Williams, but gained the opportunity to start when Williams was placed on the injured reserve list; for the rest of the season, Stewart split carries with Mike Goodson, although he was credited with the starts for the majority of these games. In a year where Carolina finished 2-14, Stewart managed to rack up 770 yards rushing and two touchdowns in 14 games played and 7 started, the worst statistical performance of his career. Stewart (far right) in 2011. In 2011, Stewart shared carries again with DeAngelo Williams, rushing for 761 yards on 5.4 yards per touch. 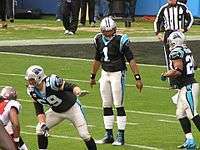 Behind rookie quarterback Cam Newton, Williams, and Stewart combined, the Panthers had one of the best rushing attacks in the NFL. Stewart had a very solid 2014-15 season. He had arguably his best game of the season against division rival New Orleans Saints with 155 yards on 20 carries. He had a career long 69 yard touchdown run in that same game. He finished the regular season with 175 carries for 809 yards and 3 rushing touchdowns. Along with that he had 25 receptions for 181 yards and one receiving touchdowns. Stewart led the NFL through weeks 12-15 with 437 rushing yards during that four week span. One of the NFL’s more elusive rushers, Stewart finished the season having forced 56 missed tackles combined as a rusher and receiver. During a week 4 victory over the Tampa Bay Buccaneers Stewart reached 5,000 career rushing yards. Going into the week 5 bye week, Stewart had a total of 220 yards rushing on 59 carries. Coming off the bye week Stewart had an impressive game in a win against the Seattle Seahawks. He carried the ball 20 times for 78 yards and two touchdowns. This marked the first time Stewart had two rushing touchdowns in one game since 2009. Stewart recorded 125 yards rushing with 5.2 yards per carry in a Sunday night victory over the Philadelphia Eagles. Stewart continued his high level of play during a Monday night win over the Indianapolis Colts, rushing for 82 yards along with a rushing touchdown. Stewart missed the final 3 games on the regular season with a foot injury. Even with the missed games, he finished with 989 rushing yards and 6 touchdowns along with 16 receptions with 99 yards and 1 receiving touchdown. Stewart finished 8th in the NFL in rushing. In the NFC Divisional Round, Stewart rushed for 106 yards and two touchdowns on 19 carries to key Carolina's 31-24 win over the Seattle Seahawks. In Super Bowl 50, Stewart rushed for 29 yards on 12 carries and scored a touchdown as the Panthers lost 24-10 to the Denver Broncos. For the season, despite missing three games, Stewart forced the 2nd most missed tackles in the NFL among all running backs. Jonathan Stewart is also an aspiring music producer and told J Z the following statement, "I don't want to hear my music being played and someone degrading women. I'm limited to that factor, but there's a lot to be talked about. If anybody wants to use my beats, I want to maintain my integrity that I have as a person." Jonathan Stewart also said this to Dubcnn about his music career with the following statement, "Music isn't a business for me. I'm not trying to supplement my lifestyle with music. I love music and I play music everyday, whether it's my piano, or making a song. It's the same with Football, I get paid well to play Football, because I'm blessed to have a lot of skill, but I could never be this good without loving the game... I love to play Football as much as I did when I was a kid and played for nothing but love. Music is the same way. God blessed me with gifts for both and I love both, but I don't do music to make money at all. I love music, so why not let people listen to it." ↑ "Timberline High School Track & Field Statistics". Athletic.net. ↑ Pac-10 Football Awards and All-Conference Team Announced, Pacific 10 Conference, December 3, 2007. ↑ "*Jonathan Stewart - Oregon, RB : 2008 NFL Draft Scout Player Profile". nfldraftscout.com. ↑ "Oregon's Stewart has toe surgery, will miss 4-6 months". ESPN.com. ↑ Yasinskas, Pat (August 14, 2012). "Breaking down Jonathan Stewart's deal". ESPN.com. Retrieved January 4, 2016. ↑ McIntyre, Brian (August 17, 2012). "Jonathan Stewart's contract extension breakdown". NFL.com. Retrieved January 4, 2016. ↑ "2014 PFF All-NFC South Team". profootballfocus.com. ↑ HipHopDX (6 July 2009). "NFL Star Jonathan Stewart Aspires To Hip Hop Production". HipHopDX. ↑ "dubcnn.com // Jonathan Stewart Interview (July 2009) // West Coast News Network //". dubcnn.com.